After re-booting the story of Red Riding Hood, Scandi developer NetEnt is back for a second Fairytale Legends video slot, this 1 based on Hansel and Gretel. It’s a 5 reel, 10 payline game that comes with NetEnt’s trademark design as well as stacked wild re-spins, overlay and transforming symbols, free spins and a pick’em round. Play from between 10p and £200 per spin. 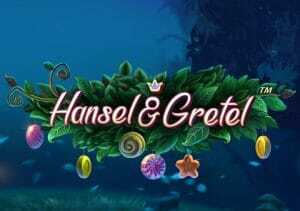 We usually have few causes for concern when it comes to the design of NetEnt video slots and Fairytale Legends: Hansel & Gretel is another good-looking game. Set in a magical forest, the reels are made up of 4 lower value gemstone symbols plus Hansel, Gretel and the Fairytale Legends logo. Land 3, 4 or 5 of the latter in combination and you’ll pocket 20, 60 or 100 coins. The brick wall is the wild – it can land fully stacked on reels 2 and 4. When it does, you’ll be awarded a re-spin with extra stacked wilds added to reels 1 and 5 as well as the usual reels 2 and 4. This is known as the Stacked Wild Re-Spin feature. Coin Win feature – does exactly what it says on the tin, awarding an instant win coin prize of up to 15 times your total stake. Candy House Bonus feature – this is a variation on the pick me round. Choose 3 sweets from the gingerbread house. Behind each of them is a multiplier. You’ll then receive the average of the 3 picks or 1 of the multiplier values. There’s up to 120 times your stake to be won in total. Free Spins feature – another self-explanatory feature, this time awarding 10 free spins. 1, 2 or 3 bonus symbols landing during the feature will give you another 2, 4 or 10 free spins. Now, stacked wilds can appear on reels 1, 2, 4 or 5 which will in turn activate the Stacked Wild Re-Spin feature for huge wins of up to 400 times your stake on each free spin! Fairy Wonder Spin feature – between 5 and 9 of the higher value Fairytale Legends logo symbols form a cluster which is overlaid on the reels for a single spin. Fairy Surprise feature – the fairy can magically appear on screen following an unsuccessful spin and with a wave of her wand choose a symbol at random. Starting with the lowest value gemstone, symbols will then morph into the chosen symbol. This continues until the transformed symbols make a winning combination. Fairy Wild Spin feature – the fairy can add 2 full stacks of wilds on to reels 1, 2, 4 or 5. Once the spin is finished and the payout made, you’ll also get a stacked wild re-spin. Fairytale Legends: Hansel & Gretel offers a nice blend of high-end design and a wide range of features. Expect to see the randomly triggered rounds more regularly than the free spins, picks round and cash win. They certainly spice up the base game action though. The fairy tale theme is a popular one with developer’s and this re-telling of the classic Brothers Grimm story is nicely done. If you enjoyed the Fairytale Legends: Red Riding Hood re-boot then Fairytale Legends: Hansel & Gretel ticks all the same boxes and is well worth considering.